Eugene Cernan was the last human being to step foot on the Moon. That was back in 1972, nearly 45 years ago. He died this past week, leaving behind a legacy of human spaceflight that has yet to receive its much-anticipated sequel. No human has traveled more than a few hundred kilometers away from the surface of the Earth since 1972's Apollo 17—back when the internet was still a theoretical idea, The Godfather Part I was the hottest new film of the year, and Elon Musk was only one year old. Since the Apollo program formally ended in the early 1970's, human spaceflight has never been the same. An on-orbit rendezvous: the Lunar Module reunites with the Command Module after a successful 3-day mission down to the surface of the Moon. Image: NASA, Apollo Project on Flickr. Rather than continue on after the Moon landings and aim for Mars, the role of human astronauts in actual space exploration declined rather quickly. Today, astronauts aren't doing any exploring. Instead, they're employed doing menial experiments in the microgravity environment of the International Space Station (ISS), stranded in Low-Earth Orbit. Despite its limited scope, NASA's human spaceflight program gobbles up a huge portion of the agency's budget—$3 billion annually just to continue operating the ISS. But the vast majority of the science being done in space is achieved by robots that cost pennies on the dollar (when compared to their human counterparts). 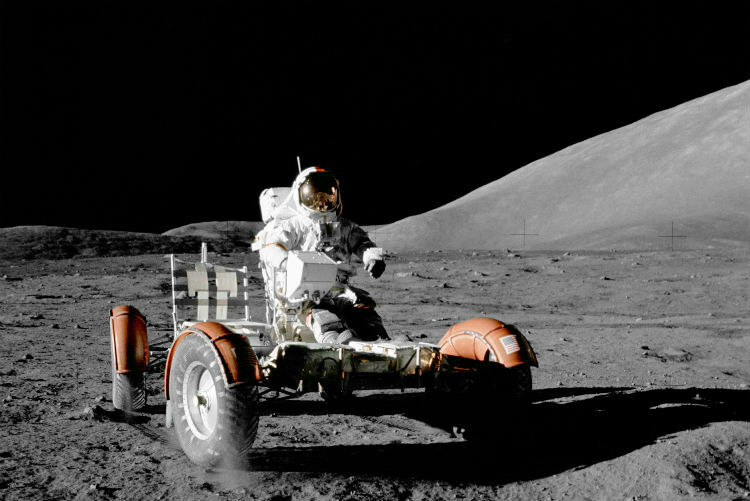 No cheap ride: Apollo 17 Commander Eugene Cernan knew how to get around the Moon in style. Image: NASA. The stuff that people really care about is the planetary science being done on the frontier: the rovers on Mars and the probes that have most recently visited Ceres, Comet 67p, Pluto, and Jupiter. And many more of these types of missions could be launched if NASA were to slash its human spaceflight budget. Here on Earth, we employ robots in a variety of areas where it makes financial sense to do so—underwater exploration robots for ocean science, automated balloons for atmospheric science, combat drones for warfare, and a multitude of robotic machines for manufacturing. And when it comes to exploring space, sending robots can be several orders of magnitude cheaper than sending humans. When astronauts first stepped foot on the Moon in the 60's and 70's, they were doing cutting-edge science. Today, we have robots like Curiosity on the surface of Mars, essentially playing the role of a field geologist on another planet. While humans on Mars would be able to accomplish more rigorous science at a faster pace, Curiosity only cost $2.5 billion. Sending humans to Mars is estimated to cost tens of billions of dollars (at the low end), and the added complexity of living astronauts makes for a lot of excess room for failure. 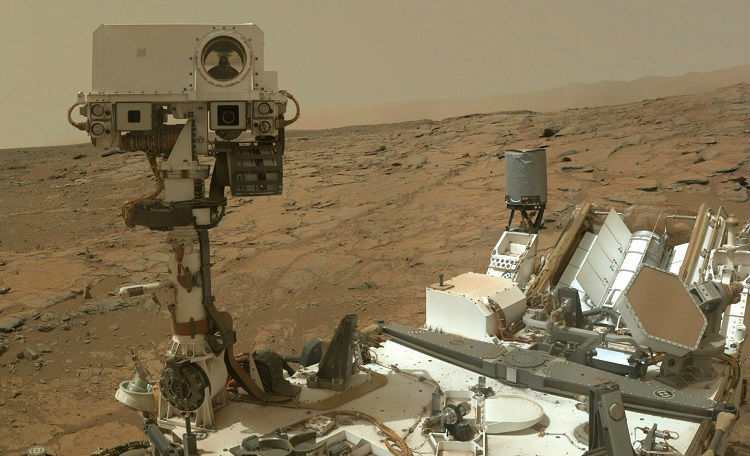 The Curiosity rover on Mars: "did somebody say ultra good-looking and cost-effective robot!?" Image: NASA/JPL-Caltech/MSSS. The lean towards robots for space exploration is even more pronounced when considering timelines. Flying to the Moon only takes a couple of days; going to Mars takes 9 months. Jupiter can take 5 years or longer, depending on how big the launch vehicle is. And for New Horizons, getting to Pluto took 10 years. Humans can't wait that long; robots can. While the benefits of sending a human mission to Mars would be colossal, arranging the budget to do so is another matter. And for the lofty price-tag that it would entail, we could potentially launch dozens of cutting-edge robotic probes, each capable of collecting useful, knowledge-enriching scientific data. That being said, cancelling NASA's human spaceflight program as it stands today wouldn't be the worst idea ever. There aren't many discoveries being made on board the ISS, and the money being spent up there might be better spent on robots. Instead of funding the space station, we could have the funds to send probes to Venus, orbiters and landers to the moons of Jupiter, a followup to Cassini that could also explore Enceladus and Titan, and a new mission that could revisit Uranus and Neptune (considering it's been around 30 years since Voyager 2 first visited). Just cutting the upkeep cost of the ISS for half a decade could provide enough funding to accomplish most of these things decently well. Besides, there's a pretty good argument to be had that the ISS isn't worth maintaining anyways! Spaceflight is inherently risky, for both astronauts and robots alike. 3.3% of all the people who have gone into space have died doing so. By comparison, only 0.07% of aircraft pilots and 0.016% of police officers in the United States will die on the job. 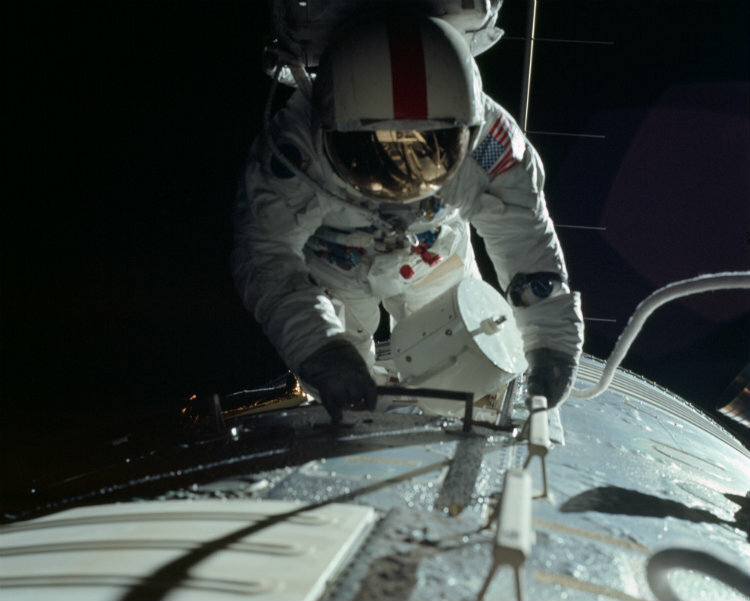 In deep-space while en-route back to Earth, Apollo astronauts had to step outside in order to retrieve film cassettes from the Command Module's external cameras. Image: NASA. If we're going to subject human beings to the inherent risks of spaceflight, it should be for a really good reason. We should respect another human's life to the extent that we wouldn't seek to endanger that life on some trivial mission. The 1986 Challenger shuttle disaster is a good example of our failure to do so. When the shuttle exploded 73 seconds after liftoff, it claimed the lives of seven astronauts (one of whom was a citizen schoolteacher who had no business being there). Its mission? To deploy a communications satellite on-orbit and conduct other simple experiments and tasks. Then, in 2003, the Columbia shuttle disaster claimed another seven lives. Its mission was to test an extended-duration module (sort of like a battery pack) to allow longer-duration spaceflight, a "SpaceHab Research Module," and a bunch of other small scientific experiments. I don't think anyone could argue that the scientific knowledge to be gained from this particular mission was worth the seven lives it ended up costing. I'm not saying that human spaceflight is too dangerous and that we shouldn't be sending humans into space at all. I'm just saying that, until space travel can be made as safe as air travel, sending humans into space should only be done for causes that are worthwhile and beneficial. It could be argued that the only human spaceflight missions to ever measurably increase our knowledge of the cosmos were the six Apollo missions that landed on the Moon. 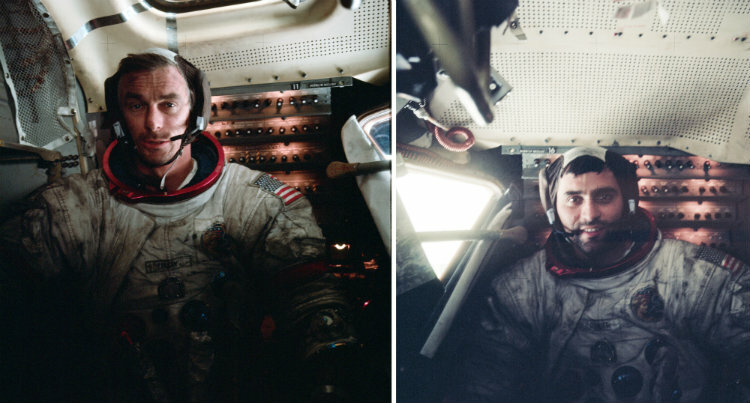 Some downtime: in between Moonwalks, Eugene Cernan and Harrison Schmitt pose for photos inside of the Lunar Module. Image: NASA. The Apollo missions returned hundreds of kilograms worth of moon rocks to Earth and gathered a treasure trove of data pertaining to the lunar environment. Nearly fifty years later, the science returned by the Apollo program is still the most comprehensive scientific data we've ever collected beyond Earth. But today in 2017, we're not learning anything significant by having astronauts living and working in space for extended periods of time. Instead, we're floating quietly in microgravity—watching the sun rise and set 18 times per day, whirling around the Earth at 27,000 Kilometers per hour. And I'm sure none of that is nearly as good as it sounds. Comparatively, Apollo should be meticulously studied as the archetypal human space program. A lofty target, a useful scientific goal, and a stepping-stone approach that saw each subsequent mission pushing the frontier back even further. That's exactly the sort of thing that human civilization needs here at the dawn of the 21st century. And there are multiple worthy targets out there. Humans could be sent to visit an asteroid, to establish a long-duration base on the Moon, or to explore Mars and its small moons. These are not simple endeavors, and they wouldn't be possible on the shoestring budget of the ISS; they would be to be costly, complicated, and risky, but ultimately beneficial—both scientifically and culturally. Putting humans on the Moon was never intended to be easy. It was an extreme long-shot, and one that actually paid off. The catch? It took a lot of organized effort, and cost a lot of money. Patriotism helped get us to the Moon. 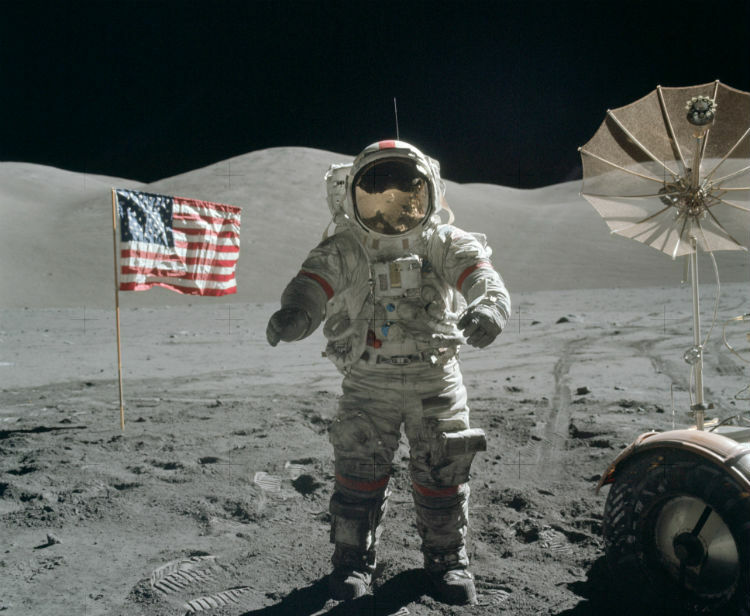 Here, Eugene Cernan poses next to the American Flag on the lunar surface. Image: NASA. Today at NASA, there are no active long-term goals. The agency often reiterates that its on a "Journey to Mars," but they've yet to lay out any detailed plans for how they're actually going to get there. With changing administrations and a lack of oversight, the United States space program has been in limbo for decades. Most recently, George W. Bush wanted humans to return to the Moon, and so NASA began building the Orion capsule and SLS rocket to do so. Obama later scrapped those plans, and said that NASA would instead aim for Mars. Now, a new president is about to enter into the fray. NASA hasn't made any concrete plans as to how it's going to use its next-generation Orion space capsule and SLS rocket, so the agency's future direction is shrouded in uncertainty. But what is certain is that NASA is committed to maintaining the ISS until 'at least' 2024—at which point it will have been 55 years since Neil Armstrong and Buzz Aldrin walked on the Moon for the first time, and 52 years since the last human beings had traveled beyond Low-Earth Orbit. With the golden era of human spaceflight now a long way behind us, everything has the appearance of stagnation about it. In order to move forward, we need to adopt a shared goal and a detailed method of achieving it—perhaps even as a global community. Until then, I don't think it's ethically responsible to continue sending humans up there. Space is hard, and some deaths along the way are probable. That said, once we do start sending astronauts out to actually explore the cosmos once again, let's make our efforts really count.